They bring the best out of each other, Son with his blistering speed of an Orient express, and Harry with a finishing instinct forged in the heavens. 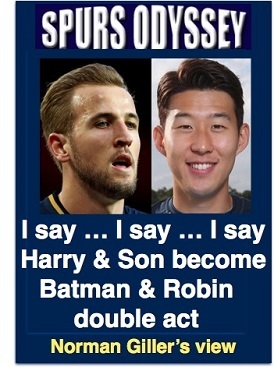 Individually they are both gifted players, together they have become the Batman and Robin of football. But, lucky, lucky Tottenham, are not just a two man attack. They are supported by the multi-talented Dele Alli, who is coming back to his mesmerising best, and backing up there�s the Belgian hokey-cokey man Moussa Dembele, who could knit sweaters with his twinkling feet. Then, pulling the strings like a maestro of a classical orchestra, is the dainty Dane Christian Eriksen. His goal in the demolition of Everton was arguably the best of the lot, described here by our Spurs Odyssey guru Paul H. Smith. Behind the Fabulous Five we come to the reliable anchorman Eric Dier, and in the middle of the defence Davinson Sanchez has achieved the impossible in filling the boots of the �irreplaceable�� Toby Alderweireld. To think Sanchez is only 21, and he can only get even better alongside the motivational Belgian artist Jan Vertonghen. Aurier and Davies are almost as effective as Walker and Rose used to be, and at the back Captain Hugo Boss is almost certain to produce world-class saves if and when the opposition break through. This Magnificent Eleven greatly cheered me up from the pit of my sick bed. I won�t bore you with the details, but in the last week I have been lying in a Dickensian women�s ward with pneumonia and a heart problem, and am only now feeling confident I am going to beat this awful Aussie flu. So glad Roy-fuelled England hammered the Aussies in yesterday�s first ODI! Thanks to Tottenham for bringing joy into my dark world, and I look forward to watching them take a step nearer an FA Cup final date down in Newport. While I was battling pneumonia in a women�s ward, dear Steve Perryman was coming through a small health crisis in an Exeter hospital. Well done, skip. We won�t let the b******ds grind us down. Onwards and upwards. Youngsters need reminding that Steve soldiered through a club record 854 games for Tottenham and twice lifted the FA Cup in back-to-back finals He remains Mr. Tottenham. COYS. WEEK 22 of the Sports Odyssey Quiz League 2017-18. The rules are simple: I ask one Tottenham-related question for which a right answer earns you two points, and then a related teaser that can bring you an extra point. Which Yorkshireman won 21 England caps while with Tottenham, and which manager brought him to White Hart Lane from Leeds? Please email your answers by Friday�s midnight deadline to: soql22@normangillerbooks.com. Question 21 was reworded to read: Who won 15 Under-21 caps and then 29 full caps for his country? From which club did he join Spurs in 2005? Most of you eventually got to Andy Reid, who joined Tottenham from Nottingham Forest along with Michael Dawson. I composed the question in the depths of my feverish illness, and I am sorry that the original version made no sense whatsoever and gave you anguish and aggravation trying to find a solution. First name drawn from the correct answers: Islington-born Mike Barrow, a veteran Spurs supporter who goes back to the Push and Run days and continues to follow the fortunes of Tottenham from his retirement home in Spain. I will send Mike a screen version of my Spurs �67 book (I have now sold all copies, and the book raised �4,000 for the Tottenham Tribute Trust to help our old heroes Thank you all those Spurs Odyssey followers who gave their support).